It is Friday and we are back with another LIVE Steem Sports Cast! Join @steemsports General Manager @scottybuckets and national radio host @sportsfanjlogli every day as they cover the hottest topics in the sports world. Don’t ever miss a show and let the guys know what you think about their banter. What a dynamite night it was as the Sweet 16 got started on Thursday night. There were four games and eight teams in action. There was a some fantastic action but the Tennessee vs. Purdue game was the craziest of the night. Tennessee opened up as a 1 point favorite but they were bet heavily online and in Las Vegas. They would go off as a 2.5 point favorite as over 70% of the money was on them. Normally when the public all goes one way in a game, Las Vegas cleans up. I always will say, “Those casinos and hotels didn’t build themselves.” And sure enough, it happened again. This is a picture of the biggest reason that the Purdue Boilermakers were able to pull off the 99-94 upset. His name is Ryan Cline and he played the game of his life. Cline would shoot 7-10 from the 3-point line and have a career high 27 points. 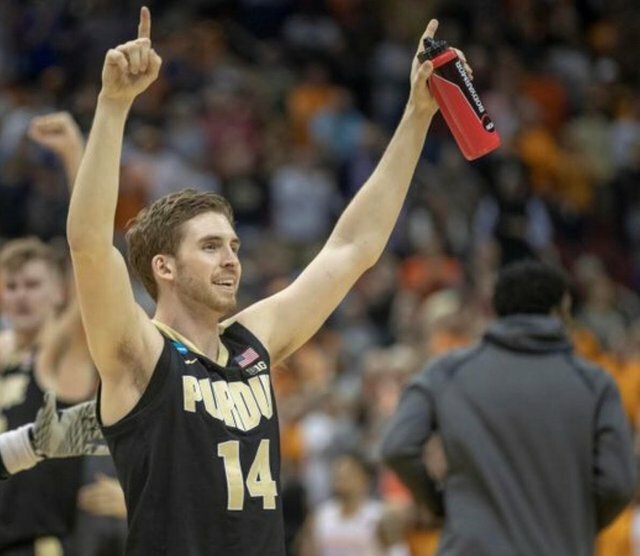 Every time Purdue needed a big shot, he was there to drain one. But even with the incredible performance by Cline, it took this terrible foul call in the closing seconds of regulation to force OT. Carson Edwards would knock down two of three foul shots and force the extra time. Tennessee could never recover from that blown call and their season is over as Purdue continues to march on!